This coming Monday marks the anniversary of one of the world’s most famous, unintentional protests. On October 31, 1517, Martin Luther sent a letter to Albert of Mainz which contained a document entitled, “Disputation of Martin Luther on the Power and Efficacy of Indulgences.” More famously known as The Ninety-Five Theses, this disputation, or protest, sparked the Protestant Reformation. 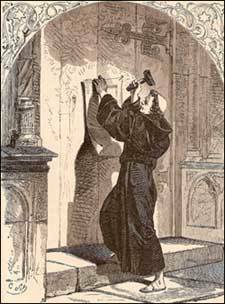 Since everybody, from Wall Street to California, is protesting and since the anniversary of the Ninety-Five Theses is coming up, I thought I’d get in on the action too. Below is a list, the product of a prayer retreat with my EFCA Missional Architect peeps earlier this year in Estes, CO. The list is not meant to be incendiary; it’s motivated by love. We are not anti-Church. We love our tribe, the EFCA. And we love the Church, the bride of Christ. However, the Church in the West needs a Second Reformation. If there was some central door to the “Institutional Church” I’d nail this list there. Every believer is a residential missionary. The church does not send missionaries, rather, sent ones are the church and God has sent already sent her. We believe in missional partnership rather than church membership. Sentness must be in every church activity or program. We believe that God, starting with Abraham, has always sent his people to accomplish his purposes in the world. If the church lacks sentness it is not functioning as the people of God should. The Irreducible Core of the Christian life: Love God, love others and make disciples is the DNA for disciple making and organizational structures rather than the institutional church serving itself (e.g., how do we make budget and grow and keep the consumer Christians happy). Being missional is not an evangelistic strategy, nor a program, or an appendage of the church. Rather, living missionally needs to be in every disciple and every process by which we make disciples. We believe a missional movement will not take lightly the issues of injustice in the world. If the Holy Spirit does not direct, the church has no hope. Too many church strategies are based upon resources, or good wisdom or a “hunch” about the future. We do not ask the Spirit of God to bless our ministry, rather we ask the Spirit how to join him in the ministry he already is blessing. God is at work in the world as much as he is at work in the church. Missional disciples experience a fullness of Jesus because we live with him in both spaces. Doing always flows out of being. Churches with staff must have regular communal practices to hear from the Father. If not, ministry flows from human giftedness and effort, not God. Authentic community is ‘family on mission.’ And churches need both community and mission. We cannot be solely focused on tasks which mirror the corporate church nor can we just focus on the inter-personal relationships which neglect the needs of the world. We believe that our Lord intended his followers to live his way of life, not merely believe the propositions that he has taught. Disciple making must be more than a Western educational experience where we download mere information. Rather, we must teach and pass down a lifestyle. “That’s why I have sent Timothy, my beloved and faithful child in the Lord. He will remind you of how I follow Christ Jesus, just as I teach in all the churches wherever I go.” 1 Corinthians 4:17. Mission flows out of conversational intimacy with Jesus. God is in the church as much as he is in the world. The church must be led together to see where he is already working in the world. We believe that parents should be equipped to teach their kids how to live on holy mission more than how to avoid “PG-13” movies. Teenagers know about morality but their faith is boring because they lack mission. (1 Peter 2:9). We need conversational intimacy with our great God –individually, in our families as well as our spiritual families. We expect miracles and experiences which can only be explained by a transcendent God and thus the church can no longer be closed to the gifts of the Spirit. Autonomous in governance, yet the local church should not be independent of each other. We need to be inter-connected (yes, financially) to love all people, especially the poor. Our current models of church favor the rich and our (EFCA) districts lack the unity to love all people. This autonomous ‘spirit’ needs to be crucified. Starting churches is insufficient because we never assume Jesus or the Gospel when we speak of church or community. Followers of Jesus must precede a 501c3. The most fruitful ministry is life on life –organic, not programmatic. As Jesus developed the three, the twelve, and the seventy-two, every shepherd must follow the Great Shepherd’s disciple making example. The church decentralized for the purpose of mission is a major contributor to why many churches outside the western world are growing (and perhaps why the church in the western world is declining). The mission that Jesus launched is different than the church. We need to be more excited about making disciples than starting churches. We believe we must be willing to re-think the busyness and activities of the church and if necessary, annihilate their existence if they do not have sentness. If these activities and programs lack sentness it’s proof they already are lacking the Gospel. We believe our church buildings should be missional training centers or missional outposts rather than containers of God’s people. We believe we must repent of a church culture that has isolated itself from the broader culture. We believe the church should exist as a missional community of hope that blesses the world around it. We are FOR the world, not AGAINST it. Being missional means that we brag less about a spectacular ministry and brag more about a sincere heart (2 Cor. 5:12). Preaching without the cross isn’t Christianity. Incarnational ministry does not mean that we are merely a distributor of goods and services to the poor, but that we know the names, the faces, and the stories of those in need. We consider them to be friends. Social justice needs reconciliation with God at its foundation or it is humanism. Leadership is not about methods, models, styles or forms; it is about character and one’s calling from God. Qualifications for ministry come from God. A seminary degree is not a requirement for leading a church –the character of Christ and the gifting/calling of the Spirit is. Apostolic and prophetic ministry should have a customary place among us. Gospel drift results from missional shift. Consumerism is the god of this church age and leaders are happy to keep feeding the monster if it means they still get a paycheck. We have taught a Gospel which emphasizes being a good moral person rather than a dangerous disciple on the mission of Jesus. Christians should be nourished by the Word of God and then act to obey. Christians today have more information from Bible studies than they can ever put into practice. Never assume that when we speak among Christian leaders of multiplying churches or even the Gospel itself, that we are speaking about Jesus. Being missional means that Jesus is Lord of all. We seek out people of peace to open pockets of people to the Gospel (Luke 10:5-6). We pray to the Lord of the Harvest for laborers of the harvest and EXPECT him to raise them up (Luke 10:2), both leaders for the harvest and leaders from the harvest. We believe we are called to exegete our local context in the same way a missionary would in a foreign cross-cultural context. Every believer is called to live on the mission that Jesus launched. Yet, that will often look different for each follower of Jesus. We believe as Jesus followers that we must be committed to sharing life in a significant way with those who are far from Jesus. As missional followers of Jesus we believe that we cannot expect people to live up to Biblical standards without the help of the Holy Spirit. We believe that we must contextualize the message of Jesus for the local culture not the local church culture. We believe we shall always be searching for intersections between the Gospel, the church and the local culture. We believe that the discipleship process can occur before the conversion experience. A big thanks to Joe Schimmels, our Missional Architect Frontman, who tweaked and massaged this list.